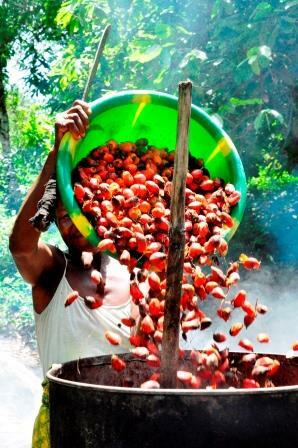 This set of documents sums up the findings of several works related to palm oil production in Bombali District, including a specific study conducted in 2017 aiming at better understanding the history of palm oil production in the North, its importance in the local economy, the cropping and processing practices... It also comes back on the pilot activities developed by Inter Aide around palm oil production in order to improve the economic situation of farming families, especially the promotion of palm oil pit processing technique. - Document 1: Palm oil production in Bombali District (northern part of Sierra Leone): after an introduction of the biology of palm oil and its main by-products, this first document focuses on a review of the different evolutions of the cropping of palm trees in the North or Sierra Leone. It also presents the traditional cropping and processing practices as well as an analysis of the local market of the different by-products and their role in the farming families' economy. - Document 2: The palm oil pit and a comparison of two artisanal processing techniques: this second document describes the technic of the palm oil pit processing. It then provides a comparison of the palm oil pit with the traditional "mortar and pestle" processing technique, through different analytical perspectives (manpower requirements, extraction rate, generated gross value,…). An appendix explains how to build and use a cemented palm oil pit (a similar document will be published soon for clay pits). - Document 3: A retrospect of the pilot experiences of Inter Aide on the diffusion of the palm oil pit: this third document (to be released in 2019) will come back on the reasons considered by Inter Aide to decide developing activities on palm oil, especially with the promotion of processing techniques using palm oil pit. It will present the different approaches that have been implemented and the related results, very mixed as regard the diffusion of cemented pits. Despite a theoretical real advantage as compared to the traditional processing practice of the mortar and the pestle, Inter Aide did not succeed to create the conditions for a spontaneous diffusion of the cemented palm oil pit. This document will analyse the factors and the constraints that have hindered a spontaneous diffusion and adoption of these cemented pits. Based on the lessons drawn from these first experiences and low results, and also considering the prevailing situation in the southern part of Sierra Leone where clay processing pits are commonly diffused for years (whereas it has never been in the South), a new approach has been designed to avoid the systematic recourse to cement and to rather encourage the use of local materials. This document will finally show to which extent this change of the methodology has contributed (or not) to facilitate the diffusion of the use of pit for palm oil processing. More generally, this experience is interesting to better understand the complexity of mechanisms and conditions that enable or limit the diffusion and the adoption of innovations among rural farming families.